Adrian comes to us from Santa Fe, Argentina where he began to play the beautiful game at 4 yrs old. In 1998, his love for the game opened new opportunities as he earned a scholarship to William Woods University in Fulton, MO. In college, Adrian was team captain and led his school to their best record in the school’s history. After graduation, Adrian was relocated to Macon by IKON (now Ricoh) in 2004, where he quickly became part of our local soccer community participating in the Middle Georgia Amateur Soccer League (MGASL), and becoming a professional trainer at Macon Soccer Club. Adrian continues to be the Club's Academy Director, position that he has held for 7 years. He also served as Select Director, and Director of Coaching for 5 years until the recent introduction of SAF (May, 2014). He has also been a member of the Club's BOD for the last 3 years. 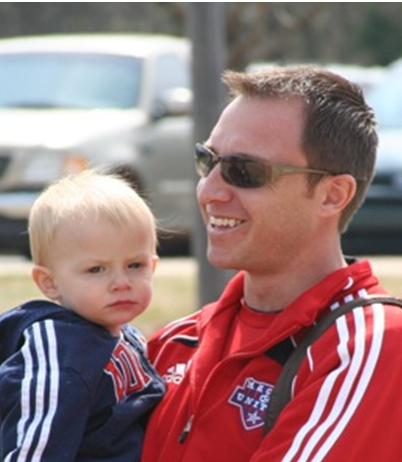 Adrian currently holds the NSCAA National Diploma, and has over 10 years of club coaching experience. Adrian resides in Macon with his wife Amanda and their 3 kids, Gavin (15), Leo (6) and Jillian (2). Chase Guerin lives in Macon, Georgia with his wife and three children. A former prosecutor, Chase owns Guerin Law Firm with his wife, Mary, representing individuals in the Middle Georgia area. Chase has been active in Macon Soccer since 2014.